Everything must come to an end, even our Tale of Four Warlords, the 8th Wonder of Ghur. 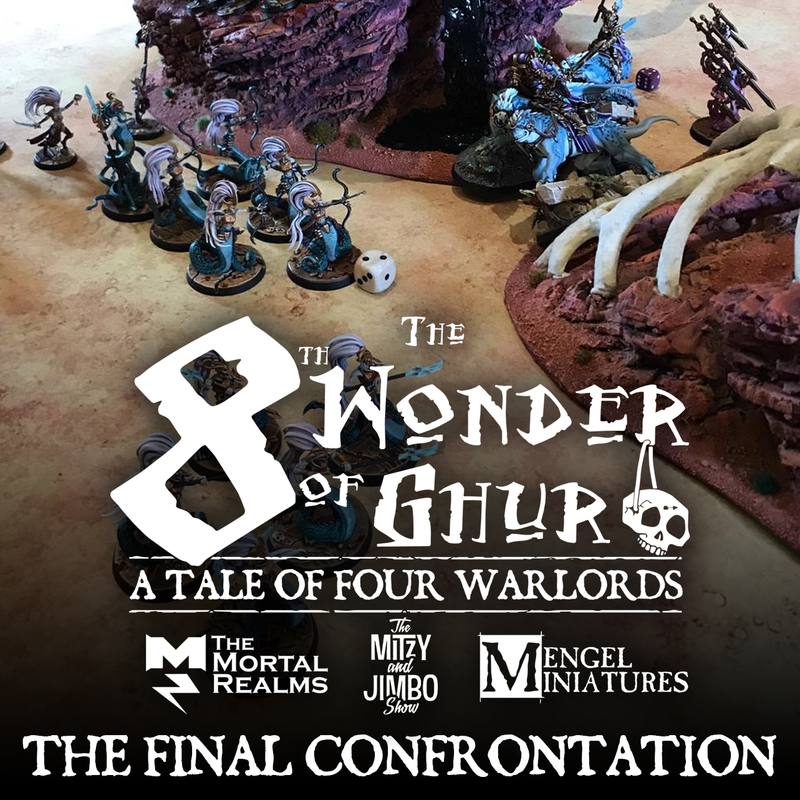 After seven months of hobbying, all four warlords met one fateful evening at Adepticon to finally settle the matter, who would claim the 8th Wonder as their own? How do you run a tale of four warlords when everyone lives in different places, some of them across the Atlantic? Host the final battle at one of the largest international gaming events there is of course! Mitzy and Jimbo were both coming over for Adepticon, and I was already planning on going. Eric came down from the frozen north for a few days as well, mainly just to play our fateful final game. That's dedication! We all agreed to play on the Friday night, mostly since that's what worked best with Adepticon for us to borrow one of their tables. We had messed around with the idea of creating some bespoke scenery for our game, but ultimately that never went anywhere. 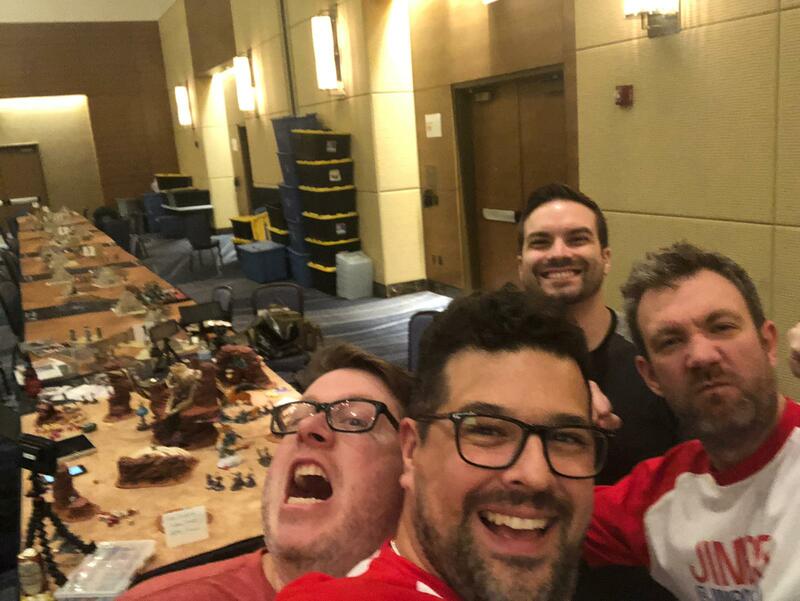 As luck would have it though, scenery maker extraordinaire Adam Trunzo, had made a brand new set of scenery for table one at Acon and it was perfect for our game! As far as what the battleplan was going to be we knew a few things going into it; it was going to be a Triumph and Treachery game, and we were going to play fast and loose with special rules to enhance our narrative. As the basis for the game we decided to use the Carnage battleplan from March's issue of White Dwarf. It's perfect for a four player games, and it's king of the hill style objective suited the narrative of the 8th Wonder of Ghur perfectly. We also added in a few extra rules, including the rampaging beasts of Ghur, which I'll get to more later. We added the rule from the narrative section of the General's Handbook 2018 that represents the concentrated magical forces that would surely be around such a potent artifact, giving +1 to all casting, but doubles causes mortal wounds on the caster. We each also picked a rule from that section to apply to our army, as long as it was fitting. 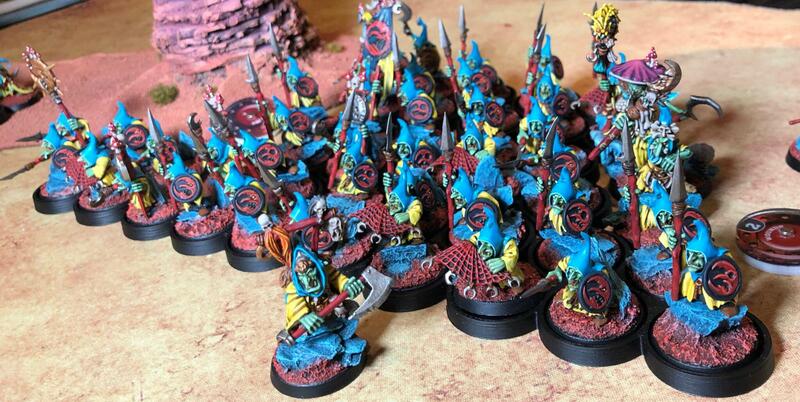 For example, I picked Regiment of Renown, which gave one of my units plus one Bravery, perfect for Mindrazor. With these rules in mind we got started as our warlords approached the monstrous skull-cave that housed the Wonder. We had all agreed on some slight tweaks to the monster rules for Ghur. An artifact of this power would surely have drawn some truly fearsome beasts to it, perhaps as a nest. 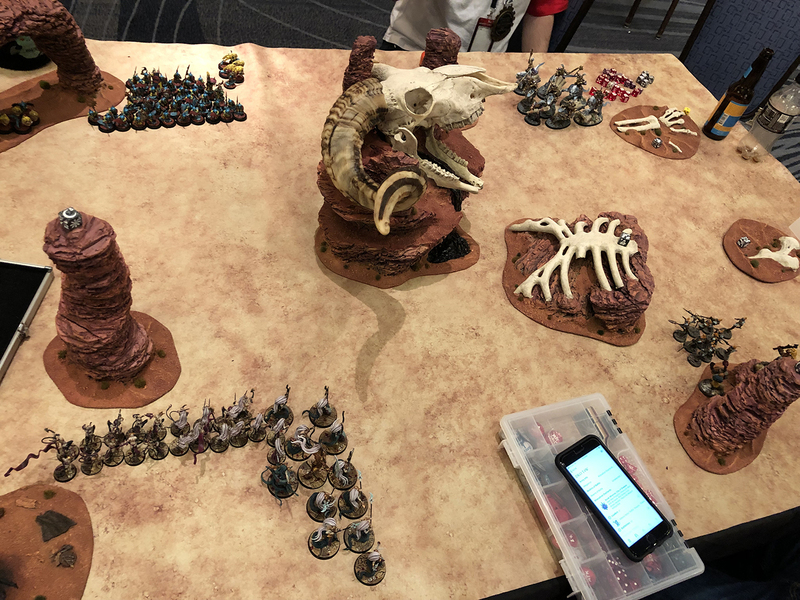 Eric had brought along some of his Tyranid conversions from his Bug-Claw Raiders army. We had the big one stand in for a Dread Maw, and for the three little guys we used the Crypt Flayer rules, but had them able to act independent of each other. Before each battle round we took turns rolling for where each of the monsters would appear, with the different quarters being numbered 1-4 and any 5s or 6s getting re-rolled. These monsters would then pop up in whatever corner they rolled, close to the center and immediately pile into whatever the closest unit was. They all got to attack first, and then the units would get a chance to attack back. After all of this was done the "sand worms" would burrow back into the ground, taking any wounds suffered with them, and then we would roll again for them at the start of the next battle round. We all took turns rolling for where they would appear and also took turns controlling them in combat. One of the really fun things about Triumph and Treachery is that you have to declare an enemy in each of your phases, hero, movement, shooting, etc, and can only interact with and do damage to that enemy. This provided a really cool and thematic element, as we all took time deciding who to pick as an enemy each turn. Eric had no wizards in his army, so if he was your enemy in the hero phase then no one could try and unbind your magic, but then in return if you have offensive spells you could only target him. There was lots of bargaining and persuasive arguments as we tried to convince each other of why they should pick someone else as their enemy for that phase. Let's get the game started! After many long months of travel and arduous battles across the plains of Ghur, the end was finally in sight. As Lathori crested the hill she saw the imposing edifice towering above all around it. A spur of rock jutted up from the barren plain, a pathway winding around it. Cresting the top of it was the skull of a truly massive beast. Its curling horns blocked out the sun and its yawning mouth formed the entrance to a cave from which emanated a warm amber glow. Sprawled out before it was the rest of the creature's remains, creating a forest of broken, sun-bleached bones. Surely this must have been some majestic godbeast, now merely a landmark for the resting place of a myth. Lathori was sure that the 8th Wonder of Ghur was the source of the amber glow, it could be nothing else. As quickly as her elation rose, it deflated slightly as she saw the banners and spears of other armies cresting the horizon. To her left a squabbling horde of Moonclan Grots bustled forward, their raucous laughter and jibes carrying across the sands. Behind them the gibbous, leering face of the Bad Moon rose, casting its baleful light across the land. 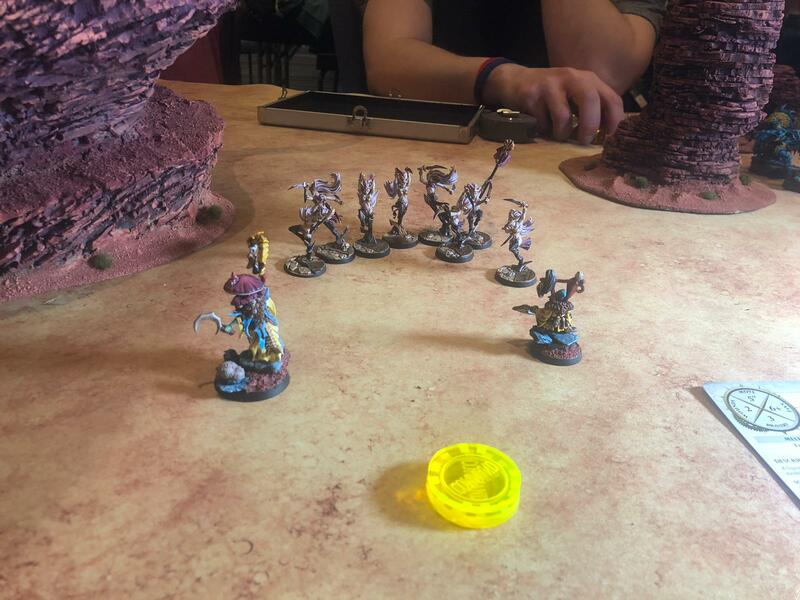 Behind the skeletal cave, the light bounced off of the gleaming plates of Sigmar's chosen. The purple and gold of the Lions of Sigmar were proudly displayed with the smell of cleansing rain upon the wind. To the right, a lone airship descended to the field of battle as a small unit of aelves in aerthermatic suits scrambled over the rocky landscape, a trio of lumbering ogors accompanying them. It appears the path to glory wasn't going to be as easy as she originally thought. Luckily Khaine was always ready for more bloodshed, and Lathori wouldn't disappoint him. As the four armies advanced upon the cave that contained the 8th Wonder of Ghur the ground begun to shake. Bursting forth before them were some form of horrible Ghurite sand worm. 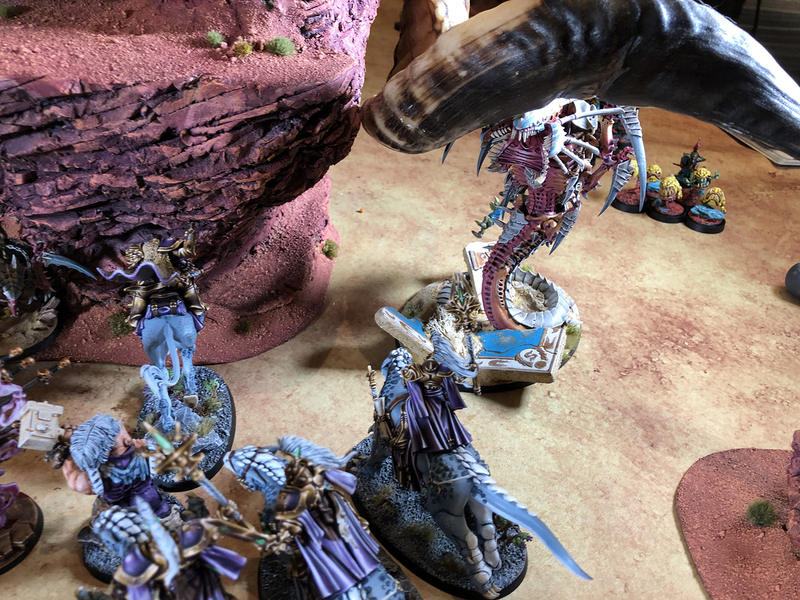 The largest of the four appeared before the Lions of Sigmar, gulping one of the Palladors down in a single bite. 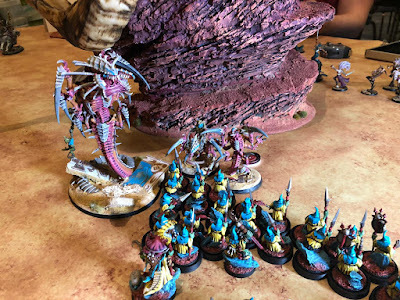 Some of the smaller ones burst forth near the Khainites, killing a Blood Stalker before the nearby Sisters of Slaughter piled in, dragging one down beneath their barbed whips and blades. Apparently satisfied for the time being, the massive beasts tunneled back beneath the ground. Conjuring the magical forces saturating the landscape, Likhis threw a set of Quicksilver Swords forward, impaling themselves on the Stormcast Eternals. 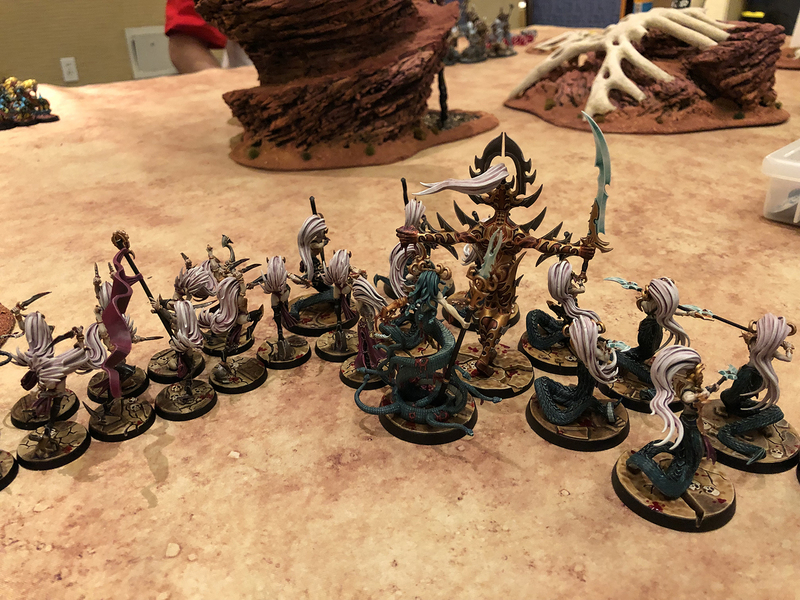 The Daughters of Khaine advanced forward, with Lathori and Likhis making their way towards the artifact while the rest of the army hedged its bets by covering all of their flanks. The Blood Stalkers took aim at the Stormcast currently dominating the center of the battlefield, wounding them slightly. 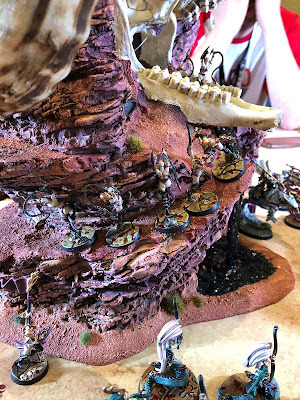 Meanwhile the Drukharidron hunkered down behind a rocky outcropping, evaluating the situation before committing their forces and the grots of Ghragz Krikgulg shambled towards the cave while also shoring up their defenses on the flank facing the Stormcast. Their cohort of Troggoths lurked in the shadows of one of the rocky outcroppings, waiting for the perfect time to reveal themselves. The Stormcast had no such qualms, and threw caution to the wind, racing towards the prize at the center. Caliginous Umbra directed her Palladors and Evocators to advance at full speed. The ground rumbled again as the Ghurite sand worms burrowed back out of the ground, this time in front of the startled grots. Diminutive greenskins were swallowed hole as the worms burst from the sand beneath their feet, several of them finding purchase with their spears, but to little effect. Diminished but undeterred, the Gloomspite Gits continued their advance on the artifact, but kept a wary distance from the fighting. perhaps if they waited long enough the forces of Order would take care of each other and they could clean up the scraps. On their left flank the golden armored Evocators of the Lions of Sigmar were getting a little too close and they unleashed their Fanatics into the Dracoline riding warriors. The balls and chains whipped around battering and bruising the Evocators, but doing very little besides. In return the Lions of Sigmar tore the grots asunder, the feline Dracolines toying with the bodies before turning their attention elsewhere. Lathori saw the Drukharidron of Admiral Ahdor Sailfin Anspear hunkered down near her lines. She knew they were just waiting for the perfect moment to launch their attack. She also knew offense is the best defense. Chanting a prayer to Khaine she woke the Avatar once more and directed it and the Blood Sisters to take care of the pesky pirates. The colossal statue quickly outpaced the Blood Sisters though and entered the melee alone, hewing half of the aelven Arkanauts in twain before the nearby Ogors piled in and clubbed the living statue to pieces. Meanwhile, the Sisters of Slaughter pirouetted up the steep incline of the cave mouth, hoping to hold the entrance against any of the other armies. The Evocators loped into the lines of the Drukharidron and quickly dispatched the survivors of the Avatar's rage, including the brutish Ogors. 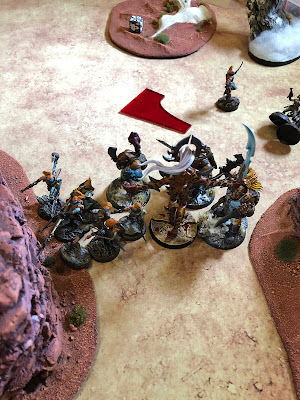 In return the nearby Grubhauler leveled its cannon at the Stormcast who had just slaughtered its companions, but failed to do much damage, its shot going wide. As the grots of Ghragz Krikgulg cackled manically, their plan going to perfection with the other forces grinding each other down, the ground rumbled once more. Apparently the sand worms liked the pungent taste of the Moonclan, and all of them surfaced once more to snack upon the hooded fiends. Again the grots failed to do much in return before the beasts burrowed back into the ground, dragging several shrieking grots with them. As they dusted off their robes they had the briefest of seconds to gather their wits before a unit of murderous Witch Aelves leapt through the drifting dust clouds into their midst. Drunk on witchbrew and imbued with both the murderous rage of Khaine thanks to Lathori and the sorcerous might of Likhis, they exploded in a flurry of blades. Once the dust cleared not a single grot was left alive. As if on cue, the Fellwater Troggoths lumbered out behind the Khainite lines, but too far away to do much good. The Sisters of Slaughter consolidated their position at the cave mouth, but were caught off guard by the speed of the Vanguard Palladors and their mercenary ogor. Bounding up the cliff face the Palladors crashed into the Sisters' side as the Ogor climbed up the opposite side, pulling the aelves to their death as he did so. Suddenly the clouds parted as the bulk of the Drukharidron forces descended from the clouds aboard their frigate. The Arkanauts and Skywardens disembarked, leveling their guns at the Stormcast arrayed before them. The Palladors were torn apart, leaving the Ogor standing in the cave mouth alone, while the rest of their shots did little damage. The waves of power radiating out from the artifact began to reach their zenith, the 8th Wonder of Ghur was calling. Sensing their time was near the Daughters seized the initiative, but were interrupted by an envoy from the Drukharidron. If the Khainites were just to wait, they would promise to abstain from directing their firepower at them. Lathori agreed, hoping that the other aelves could clear the field of battle for them first. The piratic aelves unleashed against the Stormcast once again, killing the Ogor and the Evocators. Then betrayal struck! The Enginseers flew into the Blood Stalkers, hacking and hewing with their blades. Living up to their word, not a single shot was fired against the Daughters of Khaine. Bounding into the fight Lord-Arcanum Caliginous Umbra crashed into the melee, tearing apart both parties. Meanwhile, the units of Sequitors that had been waiting in Azyr materialized on the field of battle in a flash of lightning. Brandishing all of their heavenly might they struck an impressive sight but failed to reach combat. Bellowing for reinforcements, Ghragz Krikgulg called forth another horde of grots from their Loonshrine cave, yet were also too far to intervene in the fight. With the way now clear both Likhis and Lathori raced up the cliff face at the last moment, the 8th Wonder was theirs! Lathori approached the cave's mouth, Likhis slithering before her. All around the chaos of battle still rang out as the remnant's of the Khainite pilgrimage fought to hold the other forces at bay. The ground rumbled once more as the strange sand worms resurfaced to the howling shrieks of terrified grots. However, all of her attention was focused upon the exposed back of the medusa. Gripping her dagger tightly, the Hag Queen muttered a prayer to Khaine, feeling his power course through her. 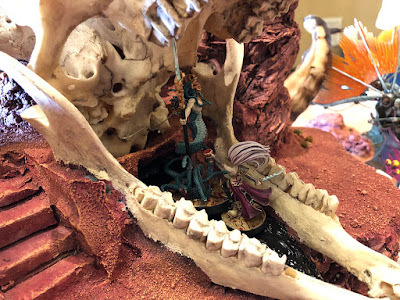 "We have done it Lathori, we shall secure the power of the eighth wonder for our temple," Likhis said as she stared down the gullet of the long dead godbeast that constituted the cave. "Yes, we have, and now it shall be mine," Lathori said as she plunged her dagger into the medusa. With a shriek of pain Likhis threw the aelf to the floor, the dagger still planted firmly between her shoulder blades. "You traitorous whelp!" she screamed as she brought her Bloodwrack Spear around, nicking Lathori's abdomen as the Hag leapt backwards. Quickly drawing a second dagger concealed in her robes, Lathori rolled to her feet, the blade held out before her in a defensive posture. "You were a fool if you thought I was going to share this power! It was I who followed the rumors of its existence. It was I who gathered the pilgrimage together. Without me we wouldn't even be here. It is mine by right," the Hag shouted. Lunging forward once more the pair traded blows in a flurry of steel and blood, neither able to best the other. Likhis coiled her length about her before shooting out her multitude of tails to entangle the Hag Queen, drawing her off her feet and against the stone floor of the cave. Leveling her spear a hair's breadth from Lathori's neck she pinned the Hag in place. Blood flowed freely from multiple wounds across her reptilian body, the first dagger still protruding from over her shoulder. Breathing heavily from the effort the medusa looked down at her with contempt. "They never trusted you Lathori. They always knew it would come to this, that's why they sent me along with you. Your devotion to Khaine is too strong, but more importantly your devotion to your own twisted ambitions outshines all else. The Shadow Queen will smile upon me for the service I have rendered today. Snipping this taint off at the bud before it has a chance to flower. I always despised..." Her words were cut off as a shot rang out within the confined space, the side of Likhis' head exploding in a shower of gore. Impossibly, somehow, the medusa still stood. What was left of her face turned in shock towards the source of her pain. A flamboyant aelf in an aethermatic suit stood at the cave's entrance, smoke coiling from his aether-pistol. "You talk to much," he said as he strode across the cave confidently. "That's your problem. You just need to finish the job quickly." He plunged his sword into the medusa's chest, before withdrawing it and removing her head from her body in a single motion. "See, no fuss, no muss." Lathori still laid where she had been pinned when the aelf walked over to her, extending a hand in assistance. "My lady Lathori, it has been a long time." The Hag Queen swatted his hand away before rising on her own, wincing in pain at the wounds caused by the medusa. "I did not need help, and even if I did I would never ask of it from you Adhor, " she hissed. A look of hurt pride briefly crossed his face as he withdrew his hand. "Of course, of course," Adhor Sailfin said, holstering his blade and pistol. "Well, it seems now we can share in the spoils," he said, gesturing at the cave before them. "I do not share," she said as she raked her dagger across his hands, drawing blood, before shoving it towards his neck. "Now, how did you put it, 'no fuss, no muss'?" The aelven admiral held up his bleeding palms in surrender, "I, uh, seem to have misread the situation." "Indeed," she said inching the blade closer to his neck. Quickly, he weaved out of her reach, knocking the blade aside as he did so. Somersaulting back towards the edge of the cave's mouth he paused. "Perhaps we shall meet again," he said before leaping into the open air and landing upon the prow of his frigate. As the airship pulled away he gave one last salute, before Lathori turned her back upon him and towards her prize. "Arrogant pirate," she said again as she stepped over Likhis' body. Without another look back she began to descend into the cave proper and the amber glow the emanated from within. The eighth wonder, whatever it may be, was within her grasp. She smiled to herself as she drew closer, the sounds of battle fading as she went further into the cave. "It shall be mine, and only mine. My time has come, my star shall ascend within Kharr Nair and all shall know my brilliance and power." When she reached the central chamber she was greeted by the sight of a floating ball of amber, its glow almost blinding in its intensity. Cautiously she approached, unsure of what to make of it. Each time she blinked it took a new form. One moment it was an amorphous blob, next it looked to be some orruk relic, then a blazing sword, a barbed crown, and finally a bladed halberd. "Strange," she muttered as she stopped before it. Reaching out she took the weapon in both hands. The surge of power was instantaneous. She felt the bestial might of Ghur flow through her, the amber light infusing her body. It was too much. Unable to let go the power of the eighth wonder of Ghur flowed into its new host. The last thing she saw was a final flash of amber before the darkness took her and she slipped into unconsciousness. Slowly she opened her eyes. Her head felt like it was being beaten and her limbs were leaden, but she was alive. Sitting up she saw she was still within the cave, the amber glow gone. Beside her was the halberd she had seen last, its design somehow Khainite even though it had clearly never been forged within the temples. Grabbing it she propped herself up. Though it had taken its toll on her, beneath the pain she could feel it. The might and fury of Ghur burned through her. A power she had never felt before. She had done it. The eighth wonder was hers. 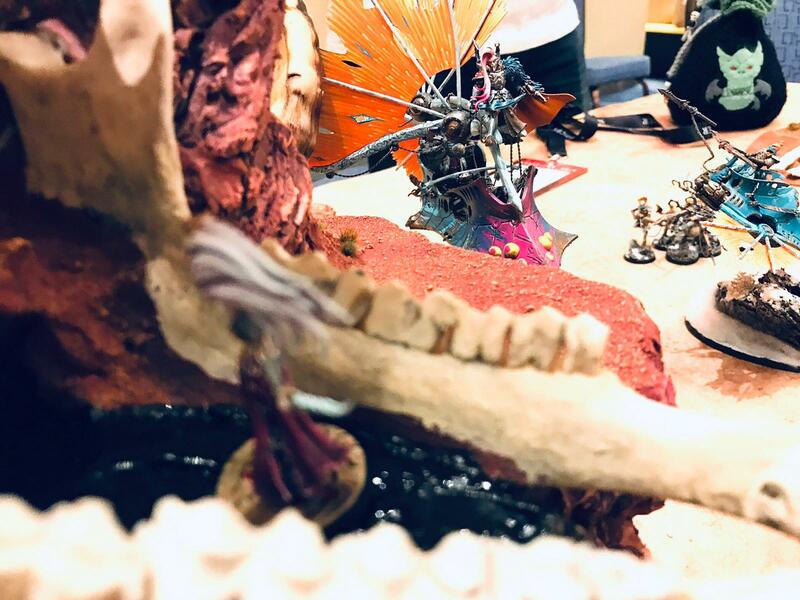 The game was a ton of fun and the perfect wrap up to our half a year adventure in hobbying. We're already talking about what we're going to do next year! I have some plans on a new version of Lathori I'm going to make to represent her with the power of the 8th Wonder of Ghur. I'm pretty excited to tackle it. 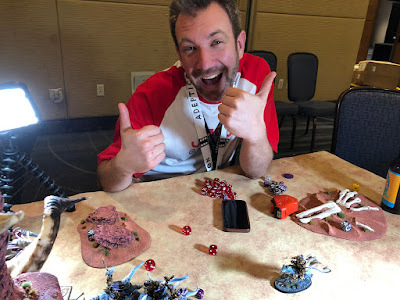 Be sure to listen to the Mortal Realms for Eric's take on it, and the Mitzy and Jimbo show for their coverage!